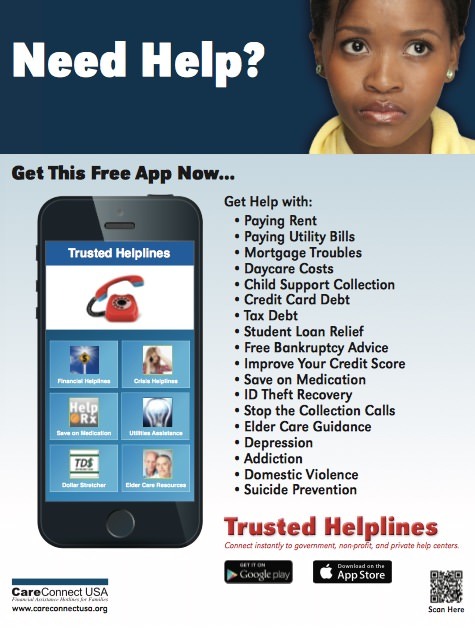 A new app called “Trusted Helplines” instantly connects employees with prescreened help centers for financial assistance. Employers are sharing the free app with their workforce to reduce financial stress at work. CareConnect USA has released the app to connect employees with help in many categories of financial assistance. At the touch of a button, users have access to government agencies, legal centers and non-profit groups, according to geographic region. Calls are free, advice is free, and the app is free. Annual surveys consistently report that over 33% of all employees feel elevated levels of financial stress at work. Personal money worries result in absenteeism, health issues, mood swings, poor job performance and even theft. When management shares helplines with employees, it does more than just show compassion. The benefit reaches the bottom line. Employees, who solve their periodic money problems, are more productive and less disruptive. Although businesses have begun to invest in financial education for employees, many struggle to measure and justify the investment. This no-cost tool eliminates that concern. For a video tour or to download, visit Video or the App Stores.